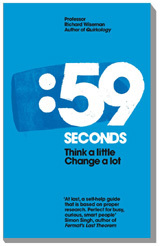 Richard Wiseman lanserer i disse dager sin nye bok, 59 Seconds. Dette er en anti-selvhjelps-selvhjelpsbok, som har som mål å vise enkle knep man kan bruke for å gjøre viktige endringer i livet sitt, men basert på forskning heller enn myter og feel-good prat. Richard Wiseman’s latest book exposes self-help myths, and presents fast-acting and scientifically proven techniques that help you achieve your aims and ambitions in less than a minute. In a study by Lien Pham and Shelley Taylor at the University of California, one group of students were asked to spend a few moments each day visualizing themselves getting a high grade in an important midterm exam. Another group were asked to imagine the process of revision by visualizing when, where and how they intended to study. The study also involved a control group of students, who went about their business as usual. The experimenters asked all of the students to make a note of the number of hours they studied each day, and monitored their final grades. Man undersøkte altså forskjellen mellom å visualisere målet (få en god karakter på en eksamen), kontra det å visualisere selve studie-/læringsprosessen. I tillegg var det en kontrollgruppe som ikke gjorde noen av delene. Even though the daydreaming exercise only lasted a few minutes, it had a significant impact on the students’ behavior, causing them to study less, and obtain lower marks in the exam. In contrast, the students who imagined themselves going through the process of studying spent significantly more time revising and eventually obtained higher exam grades. Visualizing the process of study proved especially effective at reducing exam-related anxiety, and helped students better plan and manage their workload. De som visualiserte selve målsetningen endte altså opp med å studere mindre og få dårligere karakterer, mens de som visualiserte selve læringsprosessen brukte vesentlig mer tid på studier/lesing og fikk høyere karakterer, i tillegg til at de var mer avslappet under selve eksamenen og var flinkere til å planlegge og forberede arbeidet sitt. Lignende studier innenfor andre områder, som f.eks. idrett, har vist tilsvarende resultater. Rather than fantasizing about your dreams becoming a reality, try imagining yourself taking the practical steps needed to achieve your goals.